This past Thursday, I had a much needed crafty day with my friend Christine. We used to get together regularly; but, life makes that difficult some days and it had been a while since we last got together. I worked on completing some projects I had prepped but never actually completed. Many were left over projects from card club. I usually cut one or two extras, just in case a member brings a friend, with the intention of making them up to use myself later. Of course, the pile grows and grows as I usually end up working on something else first. I pulled out my stack of unfinished items and was slightly discouraged that I couldn't remember what they were all supposed to be. I did what I could and then moved on to creating new and fun projects. I FINALLY pulled out the new hamburger box die from the 2014 catalog. It took a few minutes to get the hang of folding it; but, once I did I was off and running. Check out this super cute crab I found online and CASE'd. I absolutely adore it! 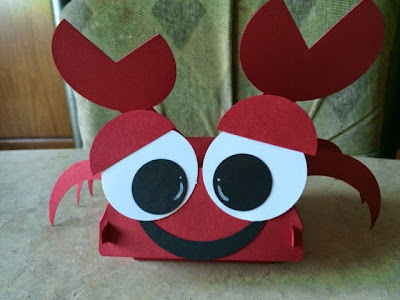 I can't wait to play with the hamburger box die some more to see what great ideas I can come up with! What do you think? Is it too much cuteness?